This is my first time posting with photos. I have owned the orig. datograph for years, love the watch, but have found it a little top heavy. I was in a store in TriBeCa in New York City recently and a ss bracelet caught my eye. This looked so similar to the Lange plat bracelet. I called the company and ordered the 20mm. This is a game changer. The bracelet totally balances the watch. I have been wearing it every day for 3 weeks. I absolutely love this combination for comfort and aesthetics. Bracelet is very smooth at lugs. 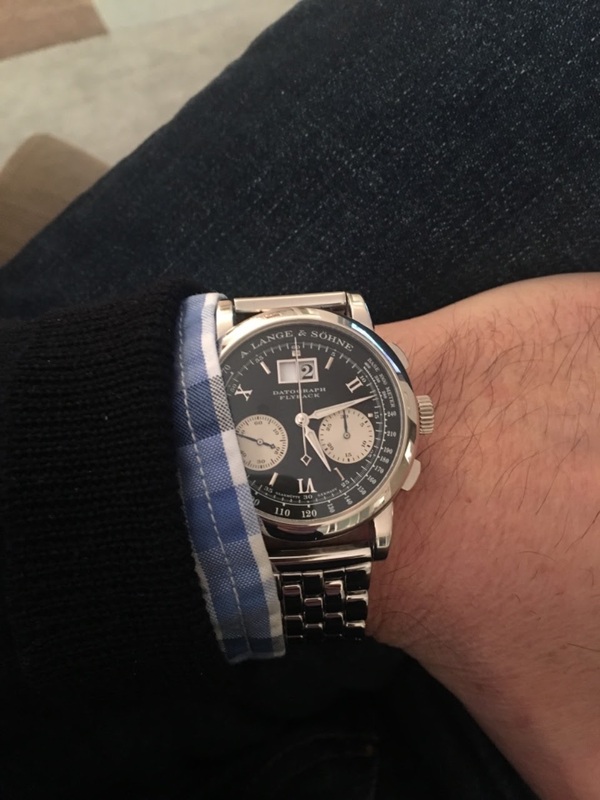 One of my favorite watches, but I don't think I could justify a bracelet (ss or pt) for it. Thanks Mr. White. I know this was not the intent for the watch, but it really works for me. 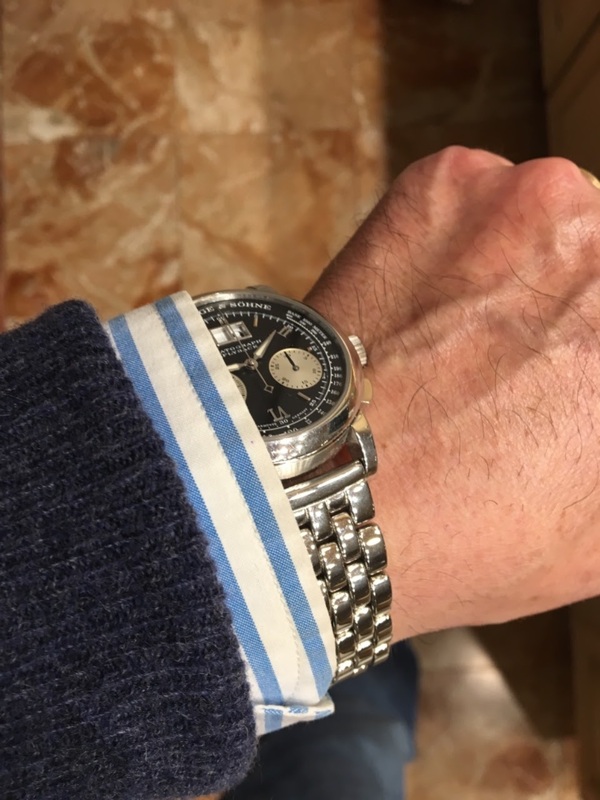 Maybe it's my preference toward bracelets with heavier watches. Oh, if it suits you, by all means. I am always of the mind that one should wear what they want. For me persona;;y, the bracelet doesn't work as I am used to it without. But I do understand and appreciate the change of pace. Enjoy it, looks great. I like the new look. I used to own the RG Dato silver dial but sold it away. I had same feeling like you that the watch always top heavy feeling when wear with leather strap. Thanks Mikesr. And now I can wear it in the nyc hot summers. And always have the option to put the leather on to change the look. I’d spring for the matching platinum bracelet but this suffices nicely too! Congrats and ENJOY! BABKA, thanks for your confidence in my ability to pay for a platinum bracelet. lol. 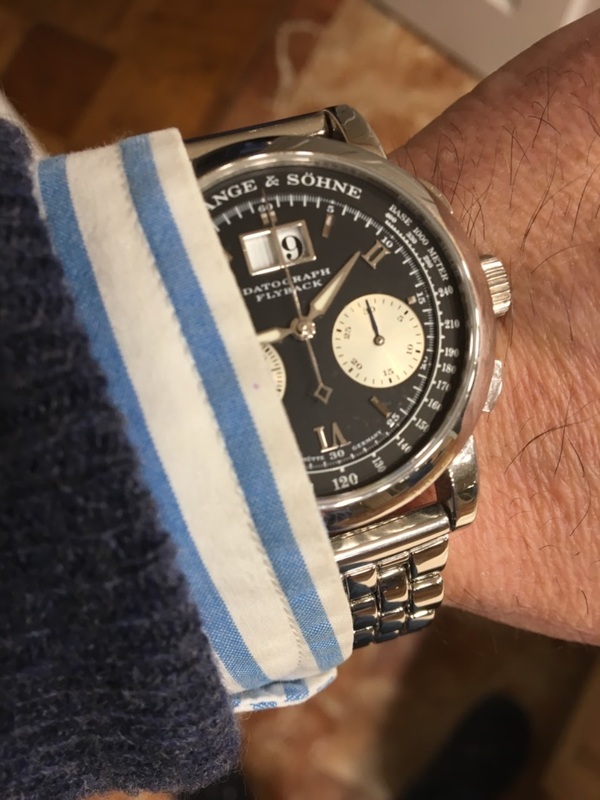 But of course, ss is lighter on the pocket and wrist. Stabilizer, thanks for your input. Chap, thanks for your compliment and I hope you get this bracelet. I PM you because I wasn't sure if I would violate rules by posting details here. I had PM you. Can you share with me the contact? Thanks. CL, I sent you an email response. Thanks for your observation. ... and posted about it here . Have been wearing this for weeks straight. So comfy!